Fasten your seatbelts as I have Star Wars, Disney Springs, Hollywood Studios, and Holidays coming your way. First off I want to address Disney Springs. Are you ready? Check out the Disney Springs site for the latest news: Disney Springs. This is something to bookmark as it lists all the businesses in Disney Springs. It lists hours for the next two months, disability access, and other information. There is a map link that opens a new window and a little icon stating if the business is in Westside, Marketplace, or the Landing. I opened the map for the shop in Splitsville and ended up in the Marketplace. Great site! It even covers the carts on the bridge and walkways. There are ground level parking lots around Cirque du Soleil for tall vehicles, long vehicles, and guests who stress out in parking garages. There is valet parking and open lots across the street. Take any road to Buena Vista Blvd, then to the garage. Coming from Hotel Plaza stay in the right lane and turn right into the garage. 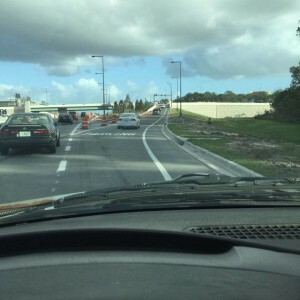 Heading from WDW stay in the right lane and be prepared to hit the ramp. At the top at the ramp turn left then right into the garage. NUMBERS!! Each level has a number showing how many spaces are open. There are water taxis at both ends and in the middle to ease getting around. The major areas left are the area in Town Center and the new parking garage. As soon as the bus station opens in the center, then guests on buses will be able to start in the middle instead of walking or taking a water taxi. The bridge across the water took me 3 minutes to go from Rainforest Cafe to T-Rex. Hoypoloi was the Sunset House of gift shops and so much fun to visit. I will greatly miss all the top notch quality gifts. They will be replaced by World of Soccer which moved out for a while to make room for Marvel. 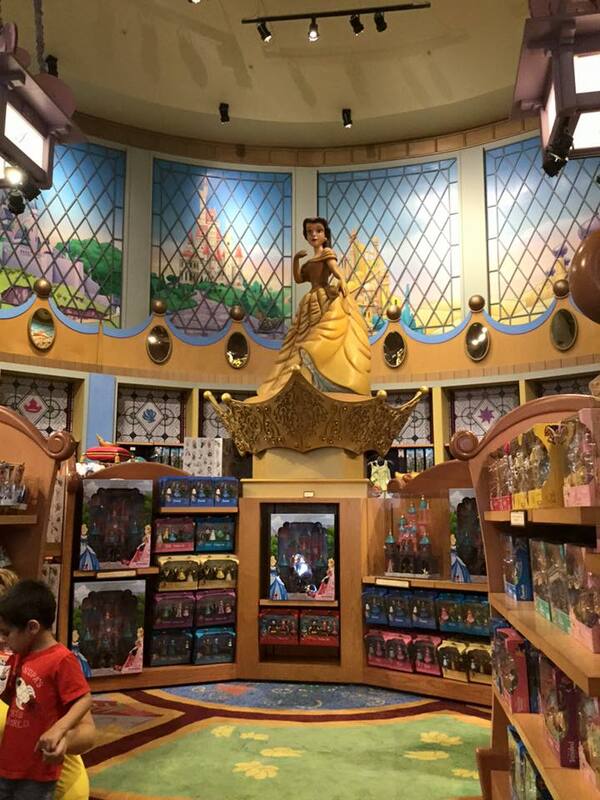 World of Disney has completed its expansion and store improvements. The store has wide aisles, bright lighting, a bathroom, and a wide front door with no steps or ramps. Rooms are themed such as Belle Room and Pinocchio room. Watch the adults as it is easy for parents to get lost. 6,000 square feet of new space now includes an information desk. SANTA CLAUS is in town. He is available from noon to 10 pm daily through the end of the year. His chalet is located on the water but he is quite busy so guests are given a pager when the lines are long. This past weekend there was a dance party, various performers and bands, and a stage show. 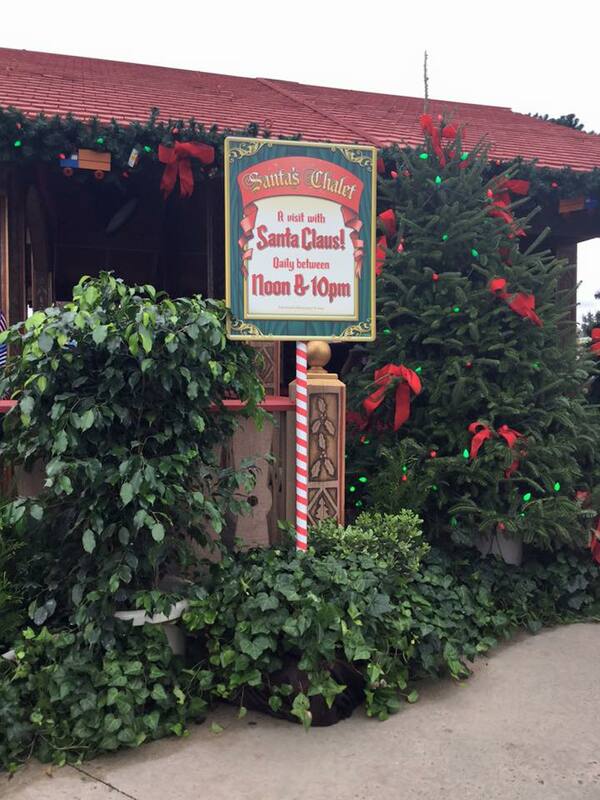 The Marketplace will have Christmas tunes from 6-10 p.m. each evening from Nov. 13- Dec. 30th. A Kwanzaa musical group appearing at the Waterside Stage Dec. 26 – 27th, and that venue will have Hannukah nightly Dec. 6 – 13th. Holiday stilt walkers appear daily through the end of the year. Some shops went all out like Jock who has travel themed wreaths and garlands. 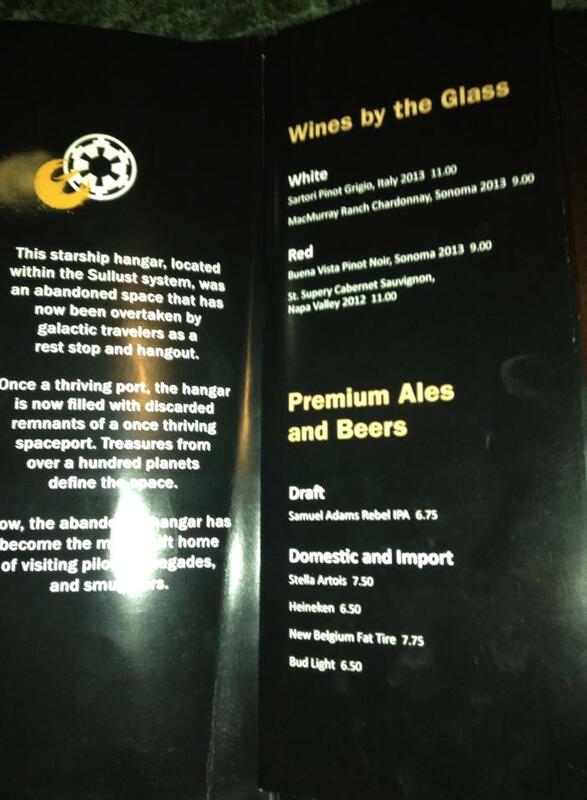 The Landing, best be known as Pleasure Landing, for its wide variety of food and beverages offered. December 15th will see the addition of one last shop, The Ganachery. Babycakes, Vivoli sorbets and gelatos, and Joffrey’s baked goods are going to be joined by a world class chocolatier. Fulton’s Crab House will feature a special surf and turf menu, including braised short ribs and Alaska King crab with mashed potatoes, crispy Brussels sprouts, lardons, and cabernet demi ($45 per person). Portobello will offer a three course meal, including a filet with roasted garlic whipped potatoes and sweet cannoli for dessert ($50 per person). Planet Hollywood and Raglan Road Irish Pub and Restaurant will offer a delicious turkey dinner. 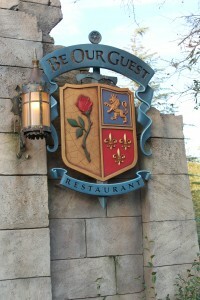 Wolfgang Puck Express will offer tender pork chop with mashed potatoes and broccolini with a special holiday dessert. Wolfgang Puck Grand Café offers a three-course meal complete with a wine selection($75 per person). 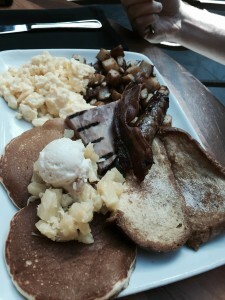 Laurie brings us her review of Big River Grille. Big River is located on the Boardwalk with sidewalk cafe seating for viewing tourists and the scenery. I sat in the bar which serves dinner and lunch from the regular menu. Overall the restaurant is disabled friendly with good lighting and comfortable seating. I wish I had sat in the main dining room but I did not want to wait. The staff was helpful, cheerful, and knew their menu. They serve tortilla chips with dip, nachos, salad and soup as appetizers. Entrees are their awesome burgers, Caesar Salad, sandwiches, steak, ribs, and other American Diner type entrees. They run a tight menu with entree having mashed potatoes and vegetables or potato chips. They have a couple of desserts, but honestly, I feel like they are running a factory line. The overall feel is an upscale American Diner that one visits after work at the office. They really try to have a classy place despite the tight menu. I can recommend this restaurant based on staff, theme, disabled friendly, and overall experience while dining. However, before the confetti and celebrating I have to address issues with the menu for Vegans and special diets that leave me puzzled. After much work they gave me a hamburg steak with toppings and mashed potatoes. Hamburg steaks are ground beef patties in a rectangle much like a Salisbury steak but no gravy. They are usually topped with gravy as Salisbury steak or plain with onions and mushrooms. The creamy mashed potatoes had pieces of skin and chunks with hints of butter. I loved the potatoes and had to stop eating just potatoes. This is one of the top five cheeseburgers in WDW. The burger was slightly smooshed but the grind was that loose, juicy meat that falls apart in your mouth. The charred parts were flavorful, savory, and well seasoned. Overal,l this was one of the best meals I have had but having to eat a hamburg steak with burger toppings is messy, hard, and does not allow a balance blend of toppings and meat. If this was served on a GF bun or in a wrap I would say it was the second best burger in all of WDW but it was a hamburg steak, sigh. RECOMMEND except for vegans, vegetarians, and those on a limited diet such as allergies and sensitivities. Upscale but kid friendly with great food and service. I would love to sit out front on a warm day and people watch. This is American Diner food with a tight menu so you won’t be able to get a wide range of substitutions unlike Boma or Pop Century. They can handle no-sodium requests with ease. Getting there requires a bus to Disney Springs or a park, then a bus or ferry to Boardwalk, Swan, Dolphin, Beach Club, and Yacht Club. One can walk from Hollywood Studios. Sometimes we forget about things like candy wrappers at the bottom of our purse. I started my day trip with the cleaning of my purse. I removed anything that could not be replaced like photos then removed pens that do not work, candy wrappers, trash, and old business cards. I went through my credit cards and put my credit cards, driver’s license, and AP discount card at the top of the pile. Do you need a Publix discount card? Most people will not use their discount cards on a trip but will spend time trying to replace them when lost or stolen. Leave at home stuff you don’t need. Make a list of places you will have to call to replace things. I moved and to this day am finding forwarded mail from companies that I forgot to notify. Do you have a copy of your eyeglass prescription so you can order a new pair? I always plan as if I was tossed into Bay Lake and came out with everything lost. If you loose your eyeglass case does it have a contact number? The contact number can be your mother or friend. As for GPS always use a local site such as Dunkin Donuts as your HOME. If you are lost you can find your way home from a store or gas station near your home. It is handy to have easy access to accounts, but in my case, someone went onto Facebook with my cellphone. There are internet sites dedicated to safety. I placed my license and AP card in the ash tray of my van. I double checked that I had charger cords, plugs, phone, ipod, Morphie battery, and other needs. When I arrived at the tollbooth I immediately handed my cards and was zooming, 10 mph, to the parking lot. At the bag check I had all bags open and I went for a short line. Each attendant has two sides so you have to watch for hidden short lines. At the entrance I went through a short line and picked up my Times Guide. I parked my scooter out of the way and made sure there were no last minute changes. This is the time for bathrooms, rentals, asking questions, planning, and guest services. It is amazing how many people stand at the entrance while waiting for family. If you go inside then move away from the entrance so others can enter. Navigating Animal Kingdom (AK) can be daunting like a trek through the jungle. The main hub is Discovery Island that is surrounded by Discovery River. The Tree of Life is on that island and can be seen in most of the park. AK has three themes for architecture. Dinoland is dinosaurs and roadside carnival. Discovery Island from Africa down and around to Dinoland is bright teal blue and Caribbean colors that can at times be whimsical. Africa and Asia are rustic villages with adobe buildings such as seen in Harambe Village and in Anandapur. These two town themes are very distinct and great for orienting oneself. At the first intersection after the bridge you will see two paths. The left path follows the river into Africa and Harmbe. Going right you will come across a path to your left that bisects the island and heads into Africa and Asia. Continuing on the path you will end up in Dinoland. 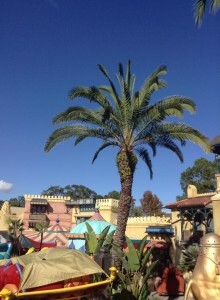 I stayed right and headed for Dinoland where I picked up some candy at the store, rode Triceratops Spin, and checked out the play area. Triceratops Spin is a hub of sorts. Across from it is the restaurant, Dinosaur the ride, bathrooms, and a shop. The playground has a greeter and only one way in or out. I enjoyed the Cretaceous Trail with shady places to rest and dinosaurs for kids to play on. Someday I am taking lunch back there for a quiet respite. I left Dinoland and followed the path with the river on my left side. My next landmark was Everest but first a stop to see Nemo. This is a large theater but I had to have a fastpass (FP) as I don’t like waiting outdoors. The area nearest the stage is the bubble zone which is ideal for kids but watch your electronic devices. Fastpass is important if you want a front row seat or to leisurely enter the theater without being trampled. I sit in the back with the scooters which gives me a panoramic view. Up close you don’t see the lighting effects on the ceiling but you do get to see the magic of the puppeteers. There are dark spots and scary spots but for most people it is a safe show. I cannot stop coming back to this air conditioned theater for more Nemo. I left with a chipper heart and headed toward Africa. I passed Everest and Kali Rapids while keeping the river to my left side. I had to stop for Flights of Wonder for an educational and fun bird show. One or two guests are chosen to hold up a dollar bill and have a bird fetch the money. Two guests are brought up on stage to sit and take pictures/videos of a large bird as it flies over their head and lands behind them. The best spots are the shady ones and the ones in the center. That is where the birds fly overhead. After the show guests came down to the stage to take pictures. I am sorry but the time of day was not in my favor as I was allowed to get close to a spectacle owl. They were letting people sit as the show started and often there is seating even on busy days. Look at the line to see how many are there and if it is getting long then hop in before it gets full. This is in front of the path that bisects Discovery Island but I took the path to the right toward Africa. Behind the carts near Africa is a back path with one covered picnic table and a few benches for a quiet escape from the crowd. This path has a stream and lots of plants. This is a food court. I love how they went into great detail on making this an old market place that has become a place for merchants and food vendors to meet. I am gluten and soy free so there was not much to eat for me. The main issue is that you stand in line, often in the sun, to get ribs then go to another line for bratwurst, and another for grilled meats. If you cannot split your party then you are stuck ordering from one window. I tried chicken skewer, chickpea salad, and watermelon lemonade. The only other things I can have in this NEW diner is cookies I get from a store and broccoli salad. I have seen the spice mix used on the chicken and be warned. It is flavorful juicy chicken with a black exterior from grilling. There are no sauces as this goes well with tzatziki, ranch, barbecue, and fruity sauces. I was happily eating my chicken when it hit me MILK! I prefer subtle sneaky spicy chicken like at the food trucks. I would eat it again but for the time, weather, and lack of choices would rather eat elsewhere. The watermelon lemonade was a sweet, delicious blend of commercial lemonade and watermelon that is not overpowered by either flavor. I was not very happy to see cold chickpeas. I am a believer as it was minced tomato, cucumber, and onions amidst cold chickpeas for a cooling and refreshing blend that I would eat again and again. There are few vegan items here and very limited offerings for special diets. They are disabled friendly but not special diets and vegan friendly. However, what I did eat and drink, was quality food that was something I would eat again, just not waiting 25 plus minutes on a slow park day. As I was on the path to Harambe, there was the market on my right, river on the left, and the village straight ahead. I had to do the Lion King show next. I learned that the Tumble Monkeys do not do acrobatics if they do not have 4 men. It is a safety issue, sorry, it rarely happens like that day one of them was injured so there was no time to get a replacement. Disabled guests sit in the front so sign up with me on the DAS if you want front row seat. All seats have a great view except the ones right behind the disabled seating. The first row is too low so kids cannot see. the third row of disable seating is on flat ground so that guests have to peer around the guests in front of them. Fastpass is recommended unless you want to wait in line. Stroller parking is on your right by the exit. When exiting take the entire family far from the theater while someone picks up the stroller. Then you can take your quiet time loading the stroller without dealing with other guests. My last Fastpass was for the safari. I could walk the line or wait 30 minutes for my Fastpass to kick in. I used my scooter to go through the line without stopping along the way until the disabled split. The ride is a lot smoother but still I was in the fourth row and was thrown around in my seat. The ride does, at times, get you some great encounters and photographs. I love the ride but it is too bouncy for me in the front. They let parents take the stroller through the line until a spot where parents drop off their stroller. Turn right to head to the village and left to do the trail which has lots of cool things to see and do, except bathrooms and food. I had an appointment so I could not do the trail. I love the displays and viewing areas so much. Isle of Java is between the Dinoland bridge and Flame Tree barbecue. They offer slushies, soft drinks, coffee drinks, pretzels, and baked goods. It is easy to miss and rarely is there a line. Flame Tree has greatly improved seating. River of Lights construction can be seen from time to time and seems to indicate an awesome show coming with new areas for guests viewing. The construction has little affect on guests besides blocking the view of the river. Avatar Land has buildings and features rising above the treeline. Stay tuned for more information as it is available. Laurie gives her take on the Dining sites that were shut down. I know there is a big mix of how people feel about these companies. I didn’t like that you had to pay to get the dining reservations but I did use them on my own personal trip and got Be Our Guest for 9 people. I have also had a few clients that used them too and loved them. So I understand that some like them and some do not. I look for reservations for my clients even after we can’t initially find them. It is very frustrating not being able to get them. I do whatever I can to see about getting them for my clients. But I also hate that people had to pay to actually get them. The first thing we need to understand is “web scraping”. Scraping is also known as Screen Scraping, Web Data Extraction, Web Harvesting, and other names. Scrapers are tools used to gather information from websites. Usually this is done for the Yellow Pages and marketing information not for scalping. Scrapers can be beneficial in collecting data for a phone directory however these tools now are leading to legal battles in court. Scrapers are a global issue affecting many companies, not just Disney. Southwest Airlines charged that scraping is Illegal as it is “Computer Fraud and Abuse”, “Damage and Loss”, “Unauthorized Access”, “Interference with Business Relations”, “Misappropriation and Unjust Enrichment”, and “Harmful Access by Computer”. This is affecting companies like eBay, Ticketmaster, and QVC Channel. Some companies do not know they are being scraped. In the case of Disney, the scrapers are using technology to beat out other guests who want dinner reservations. While it is an unfair advantage to the hard working travel agents and other guests, it has moved into charges of scalping. The companies that Disney is shutting down are profiting from scraping. While a travel agent and a guest repeatedly check the Disney site for a reservation, there is a scraper letting his computer do that work. The scraper then sells the information to his client for profit. The most common form of scalping is the resell for profit of tickets for concerts and sporting events. Disney and other companies will be shutting down anyone making a profit off of their site. When you give your travel agent your information you are assigning them as your agent. They do not profit from this hard work and do not use a tool. 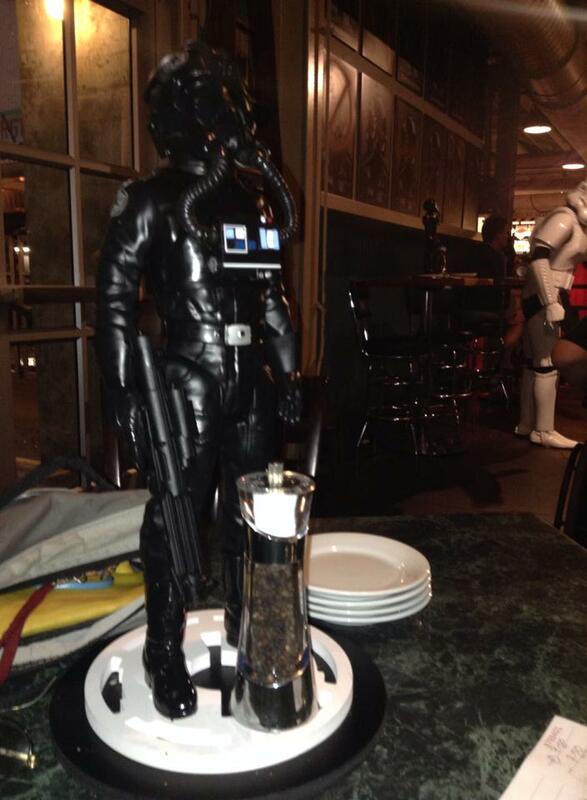 If you let your friend or family spend hours calling the dining reservation line then you will not be affected. I doubt anyone would help a friend by calling 20 times a day or going online for hours. They are only going after people who use computer tools to make a profit and to gain an unfair advantage over others. Worst of all is, that these attacks on websites can slow down or shut down a website by the onslaught of requests for information. Disney Dining Scout made $13,000 in six months while your travel agent fought off sickness, sat on line and on the phone for hours, and gave up their personal time, just so you, the guest, could get that dining reservation FOR FREE!! Imagine a person acting as your secretary for free while some guy gets paid for using a program. There are people out there who will hold your spot at a parade or help you around the parks. There are personal shoppers, as well, but all these are individuals who do not take up extra time and space. DiSDining Agent, Disney Dining Buddy, WDWTools, and WDWTableFinder all are being reported as inactive or shut down. Feel free to contact Tabitha for information and help on your trip. Laura is my guest blogger. Her and her husband celebrated their anniversary at Disney and she agreed to write up her reviews from her trip. She is a mom of three girls but got to take this trip with just her husband. Thanks Laura for sharing! We barely made our morning reservation to Kona thanks to the complete disaster with Magical Express, but so glad we did! Service was a bit slow and my diet coke sat empty most of the meal, but food was great. Zach got the Big Kahuna and really enjoyed it. I got the Samoa and it was fantastic! It was filling but didn’t make me feel stuffed. We were very pleased with the portion sizes and the flavor was out of this world. I highly recommend this restaurant! Dinner was at Ohana—the restaurant I have been trying to nail down a reservation for for all of our trips. I was expecting an amazing meal and I was not disappointed! Our favorites from the meal were the salad, noodles and shrimp! Ok, the bread pudding*** was pretty awesome (as was everything else) but we could have eaten a ton of shrimp and nothing else and left happy! We are big shrimp lovers and we both agree that those were the best shrimp we have EVER had bar none. Absolutely amazing! We will definitely be back! ***We are huge fans of the Bread and Butter pudding at Raglan Road in Downtown Disney and tho Ohana’s was out of this world amazing, Raglan Roast still wins. You MUST try it! Saturday was our anniversary and we started the day at Whispering Canyon for breakfast. I had the pulled pork sandwich and Zach got the all you can eat skillet. He was pretty disappointed with his choice–the eggs were not that great and the gravy for the biscuits was seriously just a watery tasteless liquid and wasn’t edible. The Mickey waffle was great and we had a great time overall. The atmosphere was fun and I wouldn’t be opposed to returning but we would be sticking to what we know is good to eat! We were pretty full from breakfast all day and were too full to go eat a big steak dinner at Le Cellier and we skipped it. We had a lighter dinner at the quick service place in Japan at Epcot–Katsura Grill. I had California rolls which were fantastic and Zach had the teriyaki chicken and veggies. He said it was average but not terrible and just light enough to satisfy us. We ended up closing down MK that night until 2am and I needed food about midnight and opted for a peanut butter and jelly uncrustable from Pecos Bills–about the only place open! 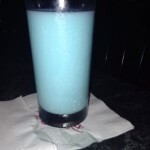 It was fantastic since I haven’t had one in years due to the girls peanut allergies! We slept in the next morning and had an early lunch at Kona Cafe at the Poly. We had some steamed pork buns which were good but have had better at Shiki Sushi in Durham. For the main meal I had the Polynesian Plate Lunch–Pan fried chicken with coconut and mango sauces. It was very good–cooked perfectly and very tasty. My only critic would be it was very sweet and needed some salt or cilantro–something–to cut the sweet. Zach had the Pan-Asian noodles with shrimp. He liked the dish just ok. It was a good portion and filling but there were no real “veggies” in the bowl–just stalks from broccoli and the chopped ends off other greens. Basically all the parts no one really eats. That was very disappointing…but the noodles were good, the sauce was good and the shrimp was good. Monday we headed over to Epcot first thing and as soon as the World Showcase opened we headed for food. We are big fans of the La Cantina de San Angel and this time instead of our typical taco plate we tried the Pollo Cascabel and it was fantastic! So glad we branched out and had something new. We grabbed some treats from the caramel store in Germany and headed back to the Poly. We chilled out for a while, had another Dole Whip (seriously, how can you NOT staying there?!) and before our bus left for the airport we had a late lunch at Captain Cook’s. I had the Aloha Pork Sandwich. That was very good but it definitely could have used some sort of sauce on it to make it a bit more moist. Zach had the Big Kahuna sandwich and he would have loved every bit if it didn’t end up having surprise mayo on it. The homemade chips were out of this world and I definitely wished I had opted for them vs the slaw (which was also very tasty). All in all, a good dining trip. Ohana, Kona and Artist Point made good (if not great) impressions and we will be returning for sure. 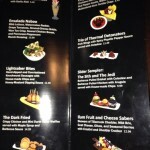 Our only regret was not getting to stop by Trader Sam’s! I totally spaced it was now open and we would have eaten there before heading to MK on Sat. vs our meal in Japan. Epic fail on our part but we know for next time to stop by to try it out! We also discovered the amazing cookies–peanut butter chocolate chip to be specific–behind the counter at the confectionery in MK. We got one on our way out about 2am and immediately wanted ALL OF THEM. They are huge, soft and irresistible. We headed over to the bakery the day we left just to go grab cookies to take home! We had to skip the PB ones this time but the white chocolate chip have been just as delicious. Next time I’m trying a cake pop or a rice krispy treat! Tabitha bought me a ticket to the first night of the WDW hard ticket event, Night of Joy. I am an old fashioned Fanny Crosby fan and was not expecting to be too happy in the Magic Kingdom. I was so wrong and am ready to discuss major issues plaguing the event as well as my happy thoughts. The major issue was the concerts. There were no theaters such as Beauty and the Beast at Hollywood Studios to hold the fans who stood in line up to 4 hours. The day I was there was rough on the fans at the forecourt. Disabled guests waited in line for 2 hours only to find out that the forecourt area had not been emptied so nobody who came for the second show was let into the forecourt area. The three stages were relatively flats so that only a few guests could clearly see the stages. Thankfully I was one of the disabled who got a front row seat in Tommorowland in a backstage area. Christian music fans are ardent fans who will wait hours to see their favorite band or musician. They get excited at the mere mention of certain names. The stages were not set up to handle 1000 fans let alone 300 fans. All stages were standing only unless you did not want to see a show. The schedule was such that most people could only see two shows at most by standing in line for hours. 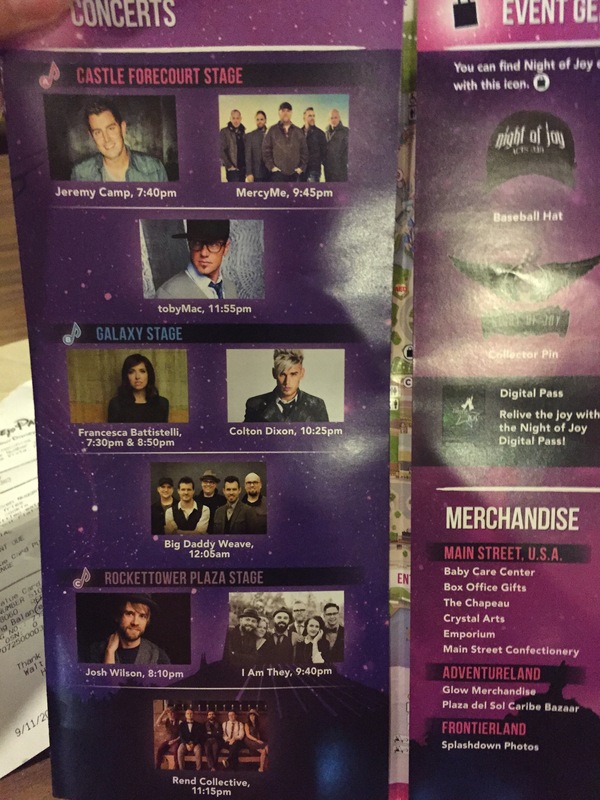 WDW staff needs to address the fact that these are diehard fans who want to see the bands. WDW announced that in 2016, there will be a venue for music and a ticket for WDW. 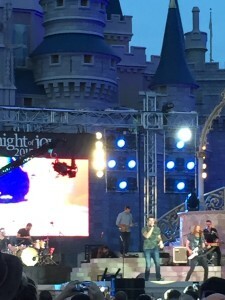 What made Night of Joy special was being able to sit far from a concert but still being able to hear the music. My boss and her son were along the ramp far by Sleepy Hollow waffle stand, they were quite happy there. I loved walking through the park with Christian music playing. Now guests will have to spend 45 minutes each way to travel from the concerts to Magic Kingdom. The old way allowed guests to do Space Mountain then listen to the concert. I liked the old way, but the issue was the lack of decent theater venues. You could walk out of a bathroom or store and hear the concerts playing then hit a ride while waiting for your favorite band to go on stage. The good news for concert goers, is that there are lots of venues at ESPN Wide World of Sports including indoor sites. It will be better for the musicians as they will have more room to set up. In theory, the biggest bands could have stadium seating for once. There are lots of places for food trucks and there is that awesome Grille for dining. World Wide of Sports has a long history of dealing with everything from tennis to cheerleader events. Next year fewer performances will be closed because of bad weather. As a die hard Baptist who avoids Christian music, this was rather pleasant. I drove Tabitha nuts when I used my phone so she could hear the concert I was at. I believe it was Big Daddy Weave, just know he was awesome and gentle with the music so that the word of God was shared. Each song had a message just like my precious hymns. If I was financially well off I would do both days next year. It is not high priority, but I feel that it was well worth the money spent and I had a great time. I have an awesome boss and friend. Thank you for a great night and a great night of fellowship. I already told you about Morimoto and will soon share my experience at the fun Hangar Bar. The third dock is open so we now can take the ferry to The Landing (Pleasure Island). You take a bus to Marketplace then a ferry half or all the way across Disney Springs or start in the middle if you use the parking garage. Stay to your right when driving to Disney Springs as there is a new ramp and bridge that gives access to the parking garage. All three pedestrian bridges are up with the one across Buena Vista just open. Now you can park across the street from Disney Springs then walk across the street without lights or traffic. All walls are down except in Town Center. They are installing a bridge connecting Town Center with the rest of Disney Springs. There is construction next to Paradiso 37. 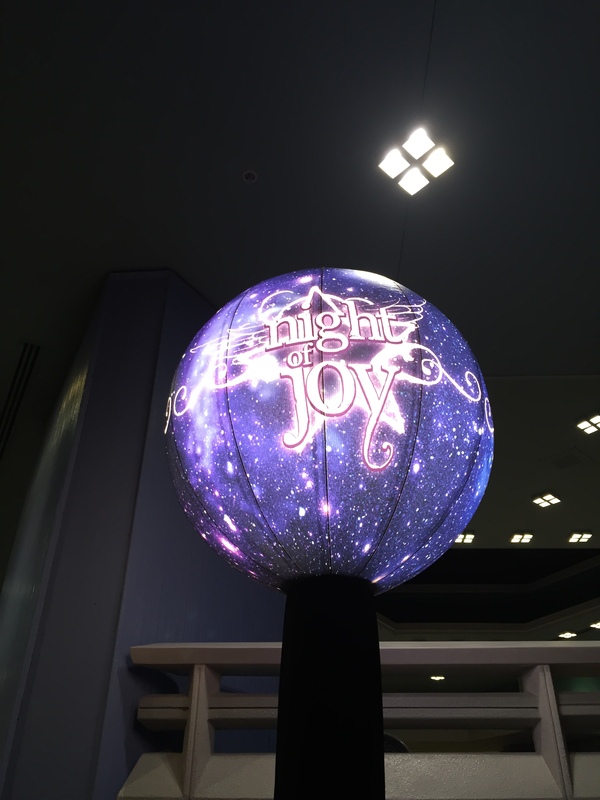 JOY!!! Paradiso 37 has had all stairs removed and now guests can stroll into the restaurant. This change makes the restaurant sit right on the street level so that guests can interact with hostesses and see the venue. The second parking garage has pillars up for the third or fourth floor. Remember to look at the numbers as you enter the parking garage as 792 spaces are open on the 5th floor while you are on the second floor looking for one of 15 spaces. I have parked on the fifth floor twice this week and both times parking was about 7 deep in the row nearest the elevator. House of Blues has discontinued the popular Service Industry Night. We have told for a year that change is coming. In the past year, or so, we lost AFI Showcase, tram tour, American Idol, Legend of Captain Jack Sparrow, Magic of Disney Animation, and the Animation Academy. The beloved hat is gone, as are the parades. Mulch, Sweat, and Shears was a fun show that is gone. This year will be the last year for the Osbourne Lights. One Man’s Dream will be closing while the theater is used to screen a preview of The Good Dinosaur. Minnie Mouse packed her bags and has moved from Center Stage to Disney Jr. Live on Stage area. Star Tours will get a new scene inspired by the upcoming film, Star Wars: The Force Awakens. A preview center will be called Star Wars Launch Bay where guests can see up and coming Star Wars items instead of learning to draw at the Animation Academy. 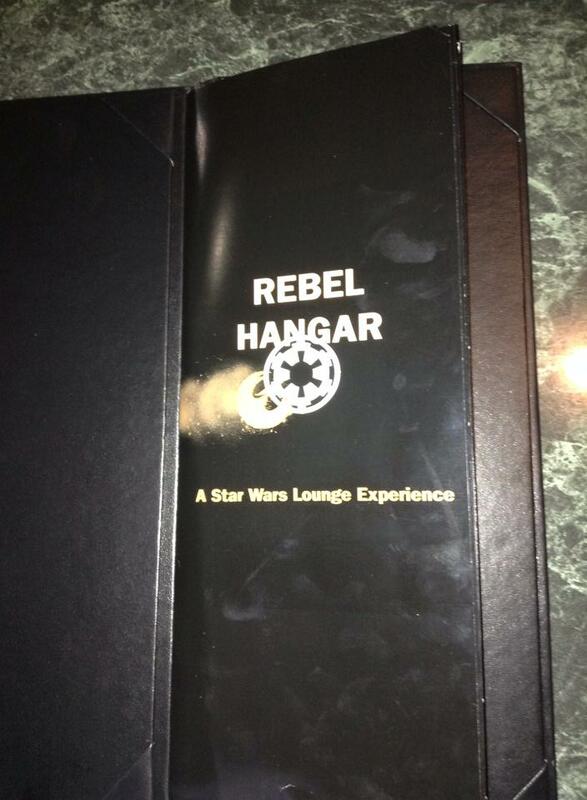 The Launch Bay will have a small retail area and a cafe. Jedi Training: Trials of the Temple will offer new characters and a villain from Star Wars Rebels. One year since Maelstrom was shut down. Duffy was removed from Epcot and Daisy Duck is moving into his home. Daisy Duck was removed from Animal Kingdom so that Flik could take up her spot near Creature Comforts. Glidden will sponsor Colortopia that opens in Innoventions East (Test Track side) this year. Innoventions West is closed for a new guest experience but the Character Spot will remain open. SOARIN’ is going to become a world experience and receive updated equipment and a third theater. On the first of October, the hair wrap locations and ring carver locations closed but are available elsewhere in Walt Disney World. Liberty Tree Tavern and the Diamond Horseshoe should open on November 19th. On November 20th, Disney’s The Magic Behind Our Steam Trains Tour and the Railroad will reopen. Peter Pan’s Flight will be closed November 2 through November 7, 2015. The hub expansion has made getting around way way easier. Jungle Skipper Canteen should be having soft openings soon. Pecos Bill has a new menu with fajitas and burritos. 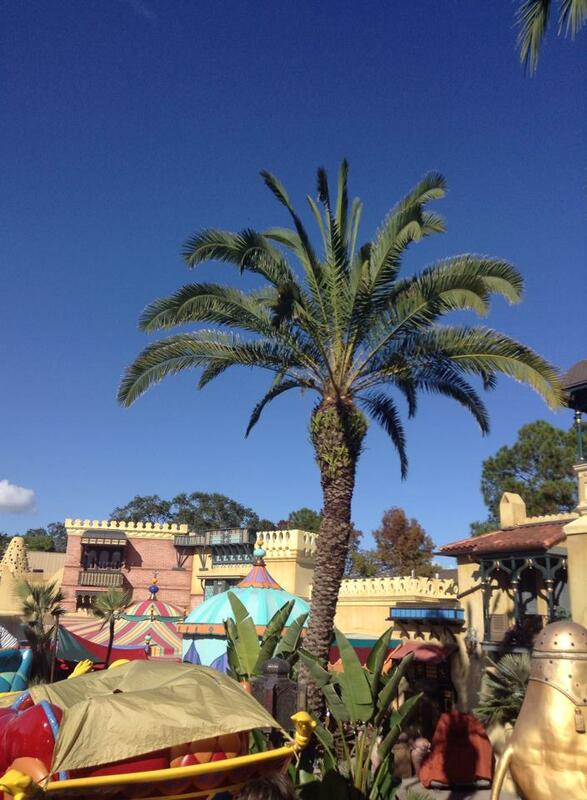 Flights of Wonder will be closed through November 5th and Primeval Whirl will be closed until November 12th. 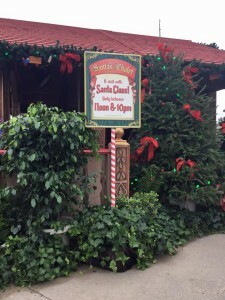 Pizzafari will be closed until November 14th, but their restroom will remain open. They are promising Rivers of Light and a nighttime safari next Spring, work is progressing. A new snack stand will open up where the Fastpass booth was at Everest. Disney’s Blizzard Beach will close for refurbishment from October 4, 2015 through January 2, 2016 then Typhoon Lagoon will close for annual refurbishment. All Star Sports will close Grand Slam Pool from October 26 through December 18, 2015. Boardwalk Inn will have painting and repairs done through May 5, 2016. Contemporary Resort will give out a bag of popcorn with the movie under the stars. The marina will be open from 11 a.m.-5 p.m through next March. Coronado Springs resort will close the Salon, Casitas Leisure Pool and the fitness center until October 19th. Polynesian’s East Leisure Pool will remain closed until January, 2016. Port Orleans will close French Quarter Kiddie Pool until Christmas, 2015. Wilderness Lodge closes on October 26th the Hidden Springs Quiet Pool, Resort Beach & Marina, Playground and Fire Pit until 2017. Caribbean Beach Resort’s bridge Connecting the Aruba and Jamaica Islands to Old Port Royale will be under refurbishment and unavailable to pedestrian traffic through November 26, 2015. Shuttles will be available every 15-20 minutes, from 6:30 a.m.-12:30 a.m., from the parking lot closest to the impacted buildings. Guests should look for their island’s name on the shuttle when returning to their rooms. Boat transportation will be available from 9 a.m.-dusk, traveling between the Aruba beach to Barefoot Bay Bike Works. Pirates of the Caribbean Spoiler – The lighting and audio are much improved. The mermaids are gone except the dead one on the beach. There are a few new pirates and the jug of whiskey is on fire, so it seems. Remember: Exclusive Thanksgiving Day feast will be held on Thursday, November 26, 2015 from 3 to 5 p.m. in the Fantasia Ballroom at Disney’s Contemporary Resort. The event also features live entertainment and Disney characters dressed in colonial attire. Prices are $68.80 per adult (age 10+) and $30.50 for ages 3-9. These rates do not include tax or gratuity. Reservations are via DVC Member Services. This is one of the best restaurants in Florida. 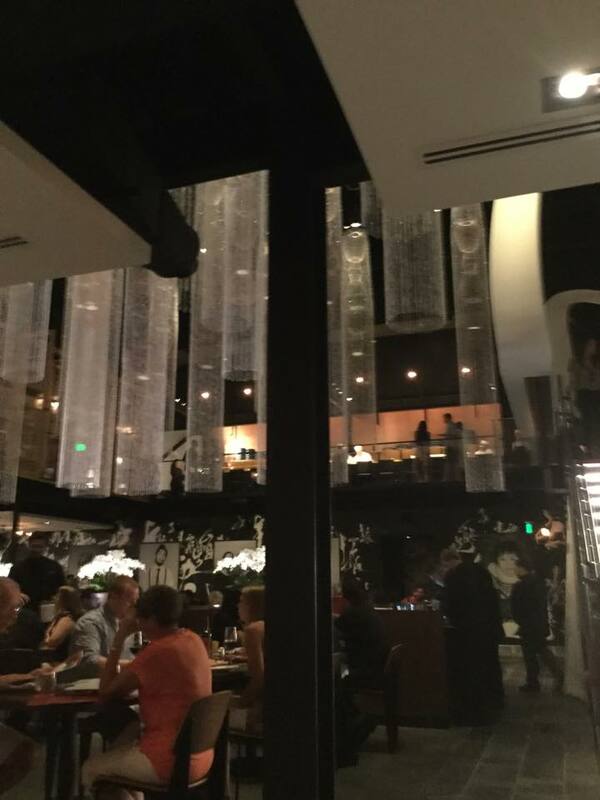 Morimoto’s is located across the lane from Raglan Road. The main entrance faces what used to be the parking lot. Eventually it will overlook a stream and Town Center but for now it is construction walls. It reminds me of New York City where you find a restaurant on a street with a sign and a glass front. Not elaborate decorations or decor. It has been kept in the Japanese old style, of simple is better. There is plenty of stroller parking but no indoor scooter parking. I went up a ramp to the front door and was greeted by a hostess in a tight red dress which some call a Chinese Wedding Dress or a Chinese restaurant hostess dress. There is a long version of this dress which is beautiful. The ladies looked stunning and were easy to identify as a hostess. As you enter there is patio seating on both floors which will eventually have a view other than walls. I was welcomed by staff at the desk and stood in awe at where they were taking me. This is a giant two story building with a sushi bar and seating along the walls. To fill in this vast void they used the most awesome and beautiful chandeliers. No longer the bottling plant, it is a sophisticated upscale restaurant with a few semiprivate areas, booths, bench seats, and armless chairs. On the table is your reusable red chopsticks waiting for you to dine. Overall, the only issue is noise but that is typical of any restaurant and should not be a problem with any guest. My meal was rather quiet and I was far enough from other guests to not have to hear them. This is opening day, so they had some major issues with getting me fed. I feel that with proper training and time, they will be a well oiled machine that will handle any dietary limitation. They had the Vice President of Patina Group and the manager of the Napa restaurant with his chef. I’ve never seen so many suits in one restaurant. Chef Morimoto was there to oversee the opening of the restaurant and he was with the customers throughout the night. Few guests could not say they had not met Morimoto. He signed my menu which I treasure dearly. He is a fun loving and jovial person who made my day special. 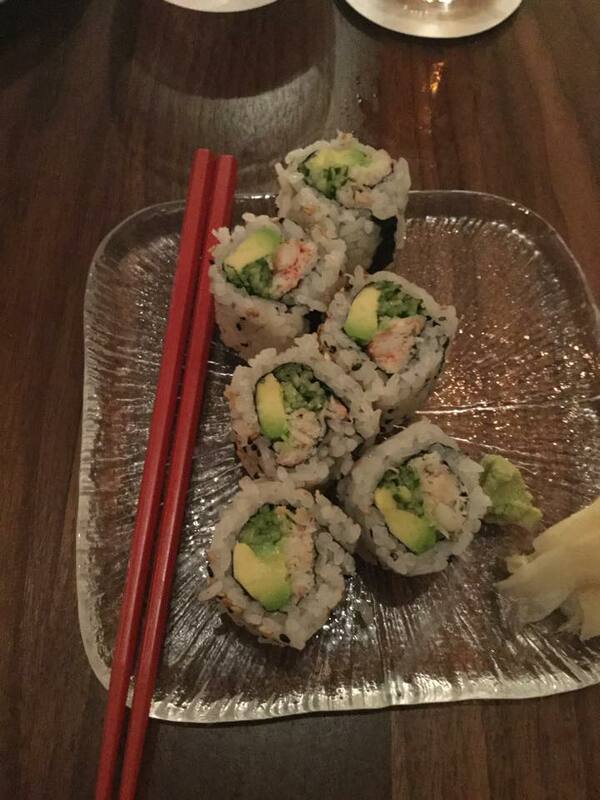 The only thing that made me sad about the menu is the use of fake crab in the California Roll. However, they can substitute real Alaskan King Crab. I received the typical pickled ginger, wasabi and 6 pieces of sushi. The rice was free of vinegar taste and the grains were individual grains not soft mush. There was toasted white sesame and black sesame seeds on the rice. I tore apart my first piece to find fresh avocado, cucumber matchsticks, and fresh crab. The next one I ate half and savored that crab flavor that made this an awesome sushi that rivals Kona Cafe for best sushi. I don’t like carpaccio or other raw meat usually. I ordered Hamachi tartar in a substituted yuzu sauce, Yamamomo Japanese mountain peach, and wasabi. The mountain peach is cherry in size and often used as a palate cleanser in Japanese restaurants. I ate mine first. It has a little bit of acidity and a fruity flavor. The Hamachi was topped with chives. It has a delicate tuna flavor and worked well with the wasabi and yuzu. It was finely chopped, or so it seemed, and melted in my mouth. The grand finale was sorbet which turned out to be a work of art. The lemon sorbet reminded me of frozen lemonade without the sugary sweetness. Next was strawberry sorbet which screamed to me PALETA!! It reminded me of the Hispanic ice pop treat that was just strawberries and sweetener. It sang of strawberries. My least favorite was the orange sorbet which still was awesome with gentle orange notes. There were a variety of berries in the bowl and I stopped when my finger hovered over the bowl as if ready to start licking. This is one of the best desserts I have ever had. 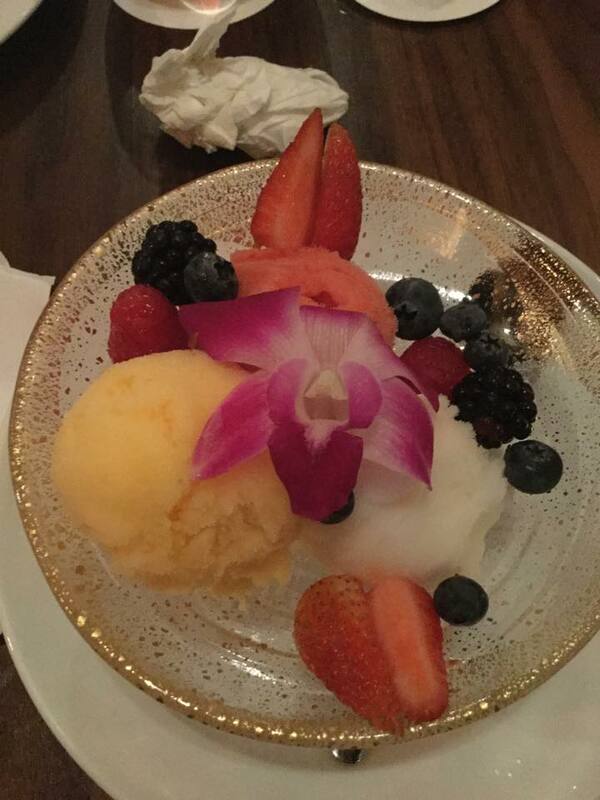 Best thing is challenging friends to eat the edible flower on top of the sorbet. You can reserve a seat at the sushi bar. Currently the quieter upstairs is available to guests when they check in but can be booked for private events. There is a bar with a few stools and a little lounge where guests can enjoy drinks and food even if they do not have a reservation. The ladies restroom has a wall of photos on black tile. Very simple and chic with plenty of room in the stalls. Under the stairs are curtains that enclose a bench seat, tables and chairs for some almost private dining. The prices are reasonable and the menu is a tight one that gives you a variety of sushi, noodles, dim sum, desserts, entrees, and soups without overwhelming the kitchen and guests. I don’t like to sit at a restaurant and spend all my time trying to choose from 20 burgers, 10 salads, or 50 appetizers. I highly RECOMMEND this restaurant. I had no reaction from my meal. They are new and still working on how to best handle special diets. I can recommend this restaurant as a safe place to dine even if you have dietary limitations. As for the rest of the restaurant, I have to say that it is one of the most awesome restaurants I have seen. The architecture, decor, theme, simplicity, and guest friendly staff make this a winner. They let a man drive his scooter to his seat then his wife took it outside. Very family and disabled friendly while being a fun place for friends to dine. The tables near me had adults having kid like fun as they shared appetizers. I cannot find one flaw in the food that was offered me nor in the staff. Except for the first rocky minutes, I had one of the best dining experiences in the past three years. People go to Planet Hollywood for the theme, atmosphere, artifacts, and overall experience. The restaurant would not be the same without the television screens, guests walking through the restaurants, loud music, and overall high noise level. The zebra print carpet that continues up the wall, wood tables topped with tablecloths, booths, and decor remind me of 1940’s and 1950’s supper clubs. The walls are covered with memorabilia and the ceilings have vehicles, motorcycles, and spacecraft hanging overhead. The major issues are noise and a lack of a special diets friendly menu. I was alright with the volume but some guests might be uncomfortable by it. The lights are dimmed but not too much. Some guests, like myself, might not like being surrounded by the videos. I wanted to turn off the images of gyrating women on a video. The seating was spaced enough but twice they parked couples in the middle of the room instead of along the wall. Those couples were in the main traffic path so they were constantly passed by guests and staff while there was an empty table that gave guests privacy. I would rather be along the wall than having food and guests going past me. The second issue was the the lack of a special diets friendly menu. The only side dish I could have was baked steak fries. The gluten free buns have soy – everything seemed to have soy. This is a major problem that should not be occurring. They use Cysco brand mass produced food. They need to work on their menu so they can offer guests with dietary limitations something. All fried foods are tossed in communal fryers. Planet Hollywood has no gluten free pasta. They have a huge menu that can overwhelm guests. Was I happy? I LOVED THE PLACE! Friendly staff, awesome food, and great atmosphere made for a great night. The first item was “potato skins” at $10.99 which was supposed to be “crispy skin filled with bacon, Mozzarella, and Monterey Jack cheese”. I received a baked potato that was cut into wedges. 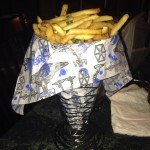 I never had fries like that, not even the ones in Long Beach that reused old baked potatoes. Just “steak fries” topped with bacon and cheese. It was delicious but not worth the cost. The menu has a few entrees but mostly salads, pasta, and sandwiches. I had the “celebrity BBQ bacon cheeseburger” without barbecue sauce and bun. It took two tries to get a burger cut in half and served on corn tortillas. I assembled this huge 10 ounce burger on the corn tortillas and began a messy food feast. Fresh tomato, lettuce and onion with smoky bacon and melted cheese topped a very loose ground patty. The meat was as if someone placed meat on the grill without touching it. The meat broke apart into juicy and flavorful bites that melded. This was the second best grind and burger I have had since Bodie’s closed. The “steak fries” were baked potato wedges not true deep fried steak fries made from a raw potato. Overall I was disappointed to sit there with a burger and fake fries while others pigged out on ribs, pasta, appetizers, and desserts. I paid about $35 for a perfect burger without bun, tons of baked potato fries, and iced tea. I spent that much at Raglan Road for three appetizers that I loved so much and I had my friendly staff and entertainment. I could have had three entrees at Pop Century. Would I go back? I have looked back at the menu and seem to be stuck with potatoes and plain meat or a huge burger that I barely finished. Everything about Planet Hollywood is perfect including the burgers. I would recommend Planet Hollywood to everyone except for a few people. Not recommended for those sensitive to strobes, loud noises, and crowds. Not recommended to anyone on a limited diet or who does not like rap music videos. If I was healthy I would love to pig out on lasagna, garlic shrimp, manicotti, barbecue ribs, mashed potatoes, and the Hollywood Bowl salad. I would sit there for over an hour as I dined with friends as we share appetizers. I would have so much fun there if I was not on a special diet. They have a full bar with many drinks dedicated to movies such as the Terminator, Dark Knight, Gorillas in the Mist, and Alabama Slammer. Us who avoid alcohol can have Pretty in Pink, Transformers, and Spiderman smoothies. The kid menu is not for little gourmets as it has spaghetti, turkey hot dogs, chicken fingers, and cheese pizza. I grew up on steak, pork, chicken, and full meals. They will give you a plate if you share with a friend or kid. Disney Springs is replacing Downtown Disney on directional signs around WDW. Construction on the hub in Magic Kingdom is winding down as more hub walkways are opened up. A major road block was the maps under the train station but now maps are in the hub on Main Street. You might catch the red paint added to Tomorrowland as they go for a new look. At Hollywood Studios, the turrets are back on the Great Movie Ride theater after being gone since 2001. All signage for Magic of Disney Animation is gone as well as the large film reel in the courtyard. There is a new billboard for Autograph Hound starring Donald Duck. People needed studio tours and studio themed parks to learn about motion pictures. Bonus features on videos, television specials, and the internet have made the studio themed amusement parks obsolete. One can read books or go online to find out everything one could want to know about books, radio, television, music, and movies. Hollywood Studios is going to see the loss of the name and anything tour related. Laurie, that is me, suggests making this a half day park and using the other half for Disney Springs, pools, miniature golf, and other parks. The media will try to keep you informed of construction and things affecting your trip. Have a back up plan for Hollywood Studios. Stay tuned for a list of park refurbishments and a review of All Star Resorts dining. This past year saw an end to WDW arcade games that feature gambling. It is considered in Florida a form of gambling when a person pays to play a game in hope of winning something. Most common is the claw machine seen in Toy Story. These games too often are rigged by vendors or have such low odds that winning is impossible. Also removed where any games that offered prizes such as Skee Ball. WDW arcades use a point system with games activated by a card that can be refilled and can be shared by family members. Price is 1.25 to 2 cents per point. Games that I saw ran from 15 to 80 points. Guests must plan their purchases as the cheapest rate is the $25 card. 25 purchases of $1 each gives you just 1,250 points compared to the one purchase that gives you 2,000 points. Old games like Pac Man start at 15 points and go up to 80 points for an ESPN racing game. Kiddie games can hit 50 points, pinball machines at 50 or 60 points, and most racing games that are not the elite are 60 points. I am an old gamer who played pinball back in the 1970’s when Tabitha wore frilly socks. Back then the games were well maintained by men who knew the games and could fix any of them. Nowadays I find most pinball machines just don’t have that well maintained feel of the old machines. My advice is to consider the amount of joy versus the cost. Pop Century arcade was remodeled. No more lounging on ottomans and no more redemption booths. Scattered through the arcade are hard bench seats that are meant to not be comfortable. One used to be able to crash in there while the kids spent time having fun. There is a gray patch in the carpet where the redemption area was located. Gaming is fun and my life for nearly 40 years so for me there will always be the thrill of seeing games especially pinball machines. Hot Weather and Your Electronics, A Strong Reminder! Phones, kindles, laptops, iPods, cameras, and other electronics have a temperature range usually of 0º and 35º C (32º to 95º F). They can usually be stored at 0º and 35º C (32º to 95º F). High heat in a car can go from 60 to 100 degrees. In triple digit weather the dashboard can be hot enough to grill chicken and burgers. Other things not to leave in a hot car are makeup, crayons, food, drinks, and anything that cannot stand high heat. Don’t risk loosing your travel memories when your electronic device or camera is fried. Be vigilant about the sun as I have seen kids in strollers covered with sunscreen and shade but some part of their body has bright sun on the baby. People set their camera down for a few minutes and come back to find a fried camera. Ipods are more sensitive to heat at the sun beats down on their case which is the Ipod’s means of cooling itself. Using certain features in hot conditions or direct sunlight for an extended period of time, such as GPS tracking or navigation in a car, or playing a graphics-intensive game. Laurie, me, froze her Ipod last year while in central Florida. Pictures disappeared and the screen went black. It is easy to fry electronic devices in central Florida. Hot cars, using while in the hot sun, excessive usage on a very hot day, laying down on hot surfaces, and power hungry apps can shut down digital cameras, iPhones, iPods, laptops, and anything electrical. Check your battery use to see what is pulling on your battery as sometimes turning off an app can stop battery drain and overheating. Airplane mode can also help slow down heating. Remove case and accessories as those hold heat, avoid charging as that adds heat, lower screen brightness, and turn off GPS. Try to carry Morphy or other batteries and charge indoors such as during lunch. You can charge with Morphy while indoors at a ride, line, show, or restaurant. I carry mine in my purse. Medical devices have warnings on temperature which you must heed. DO NOT put your device in a fridge as the condensation can be worse than the heat. Wait to warm or cool the device before using again. Have patience!!! Frozen iPods have been know to shatter the screens. I have held my Ipod over a air vent and have placed damp compresses on the case where water cannot enter. Prevention is the best solution. In cold weather put the devices in your coat near your body. Starting July 26, 2015 guests aged 3-12 can be beautified for the Coronation Day revelries at the Ice Palace Boutique. Much like Bibbidi Bobbidi Boutiques but with a Frozen theme. The three packages include reserve seating and access to the Ice Palace Cafe for the child and up to 5 of her guests. The cafe and the boutique are located across the street from ABC Commisary but I am not sure if that is the old Jack Sparrow building or the Sounds Dangerous building. We will let you know when details come out. Packages are $75 for regular package to $240 for a package that includes a costume. This should end on September 7, 2015 but who knows what lies in store for the Studios. The things I can’t wait to see are the new gelato shop in DTD, the changes in Animal Kingdom, and the Food and Wine Festival. I am eager to go to the Food and Wine festival as this year is the Chew Lab named for the show. Next Eats will feature trends in food such as liquid nitro chocolate almond truffles. I am looking forward to afternoons sampling cheese. In Animal Kingdom, the Zuri’s Sweets Shop is offering bags of four savory flavors of popcorn: Harissa, African Spice, Curry, and Ras El Hanout. $5.95 will get you Chili Pepper, Coriander, Paprika, Red Pepper, Dehydrated Garlic, Cinnamon, Caraway, ginger and other spices and herbs. This is on my list of things to try this year. Joffrey’s Tea Trader Cafe offers baked goods, tea, and some merchandise. They are neighbors with Vivoli il Gelato and BabyCakes. Vegan and regular baked goods with gelato and tea make for a wonderful evening treat while listening to the musicians. Victoria & Albert is adding a 10 course menu which is small plates of food so that guest can try more varieties of food. “Disney Family Culinary Adventure” is coming to The Contemporary Resort for guests ages 9 and up, who will get to experience WDW restaurants first hand. Boardwalk Bakery is offering, for $8.95, a maple waffle cone filled with scrambled eggs, cheese, and bacon with side of fruit. Tabitha will have to try that for me as it sounds yummy. Brown Derby Lounge adds new dishes that include a Grilled Bloody Mary-marinated Shrimp and Chorizo and Heirloom Tomatoes on Toasted Ciabatta bread, Corn Bisque served with a Corn and Lobster Fritter; and Crispy Bites that are Parmesan and Goat Cheese Risotto Sticks. Tragic news is the loss of plastic cheese aka “liquid cheese” for nachos. I don’t know if this will ever return other than offered by staff with a meal. It is rumored that people were getting burned by the vats and by the liquid cheese. Disney is good at fixing such things. Write WDW and demand your cheese if it means a lot to you. There is word that the selfie sticks are banned from all WDW rides and attractions. I (Laurie) did a search of the WDW site and have found no such rules listed. However, selfie sticks are covered under ride rules that are not made public. On Kali River Rapids, one is to stow ALL gear which means selfie sticks. They retrieve lots of cameras that fall overboard when guests try to take pictures even back before the selfie stick was invented. Tower of Terror requires gear to be stowed yet every night they scrape up the remains of phones and cameras. No selfie stick was harmed. Signs are going up that prohibit selfie sticks. Greeters are going to be trained to remind guests about selfie sticks if they see them. Greeters will not hunt for selfie sticks. Selfie sticks will be treated like cameras, canes, crutches, hats, and anything else that can and will go flying on a ride. If they say stow gear then you have to stow your selfie stick. If they tell you to hold on with both hands, then put away your selfie stick. Selfie sticks on a ride can go flying into other guests or the ride itself. During shows, the selfie stick can hit other guests especially on simulator type theaters and they are distracting as they invade other people’s space. Would you hold a cane out in front of you? 1. Do you really need that shot? Billions of images have been made over the past century of amusement parks without selfie sticks. 2. How much time is used to set up a shot? 10 selfies at 3 minutes each is 30 minutes. That is half an hour that could be spent eating or riding a ride. 3. Whose space are you entering with your selfie stick? I ducked because a selfie stick came swinging at my head. People see your body not the selfie stick!!! People will pivot as they try for the perfect, ultimate, award winning shot. As they pivot they swing that selfie stick without seeing objects, horses, and people around them. 4. ROAD HOG! I promised Tabitha to be nice, but one thing that irks me to no end, is the person who has to have that perfect shot. With or without a selfie stick they want you to stop what you are doing and not interrupt their shot. All guests must go around the photo shoot and must not enter the scene. It doesn’t matter that a kid has a dirty diaper, a person is sick, someone has a fastpass, or a cast member is trying to get to work. STOP!! Photo shoot in progress so everyone walk around or wait. Worst is when photo shoots are in narrow paths and everyone is forced to walk single file. Bridge photo shoots are the worst as they require everyone on the bridge to stop. 5. Down in front, please! For us in scooters, the kids, and many other guests, it is hard to see over your selfie stick and camera. All of my parade shots are from my chest area. I hold my camera chest high so as not to interupt everyone. My images are not perfect but they invoke memories. It is not fair for guests at a parade to suddenly get whacked by a selfie stick. 6. Failure of guests to act in a civil and fair manner will end up with rules. We have gates on rides and yellow lines because of guests jumping into ride vehicles before the current guest exit the vehicle. Because of careless parents we are now asked to put kids on the inside of the ride vehicle. People parked at resorts to avoid paying parking so now resorts are very strict on who parks at their resorts. Selfie stick users need to be careful or there could be tighter rules. 7. There are cast members and guests who will gladly take your picture. The photographers in the parks will take your picture. Have a friend stand on a bridge and wait to snap pictures of you on rides. Try to remember that you are sharing a public area with disabled guests, short people, kids, and a wide variety of people who cannot see well. Try to remember that instead of doing selfies you can savor moments with your group. It was a fun tool until people got hurt. Look around you and see what you paid to visit. I regret that in 1998 I spent too much time on camcorder time instead of savoring the experience. 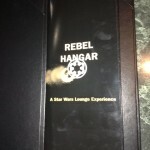 Laurie brings us her take on the changes at The Great Movie Ride along with her review of the Rebel Hangar. The biggest changes are the opening and closing montages. I was not able to stay long enough to see all of the opening sequence in the waiting area but you can find online, the opening montage. The closing montage was too fast for me as I prefer to savor the clips and remember those moments. GOOD MORNING VIETNAM has remained as are some of the best ones from the past. Added were Frozen, Rapunzel, Bruce and Nemo from Finding Nemo, and the Incredibles as well as modern classics like new scenes Star Wars, Pirates of the Caribbean, Guardians of the Galaxy. As before, it is fast moving, and best seen on YouTube. The montage now focuses on themes and genres, as well as, gets rid of some violent images like the chariot crash. Robert Osborne does a fine job narrating. TCM is the new sponsor so you will find “The Great Movie Ride Presented by TCM” on posters that replaced most of the old posters such as Titanic. A new tag is “presented by TCM” that can be found at the entrance marquee, the marquee at the loading area, and on the Mary Poppins display. Some artifacts have been replaced with new artifacts. Outside is a “photo op” area that few know exists, few actually use it as a photo opportunity (photo op), and many use as a shelter in the time of storms. WARNING: read and study BEFORE you go to the park. I told a group that the nearest food open at 9 pm might be at Sunset Boulevard. I had left the Rebel Hangar after closing into a downpour. Depending on the day you go you might find certain restaurants closing early, paths blocked because of fireworks, and rides closing before the park closes. This advice applies to all areas of WDW, Seaworld, Universal Studios, and Legoland. Always have plans in case something is missed or is closed. I met a family sitting in a photo op area and started talking with them. Finally, I told them that they might as well do Toy Story Mania and wait in a dry warm room instead of sitting out there doing nothing. Reservations are recommended. We arrived late so were able to be seated immediately. I was not overwhelmed with the theme and decor. Maybe if I had time to walk around I might have seen something awesome. There are guests who are not dining that wander the halls looking at the decor and getting pictures with the storm troopers. 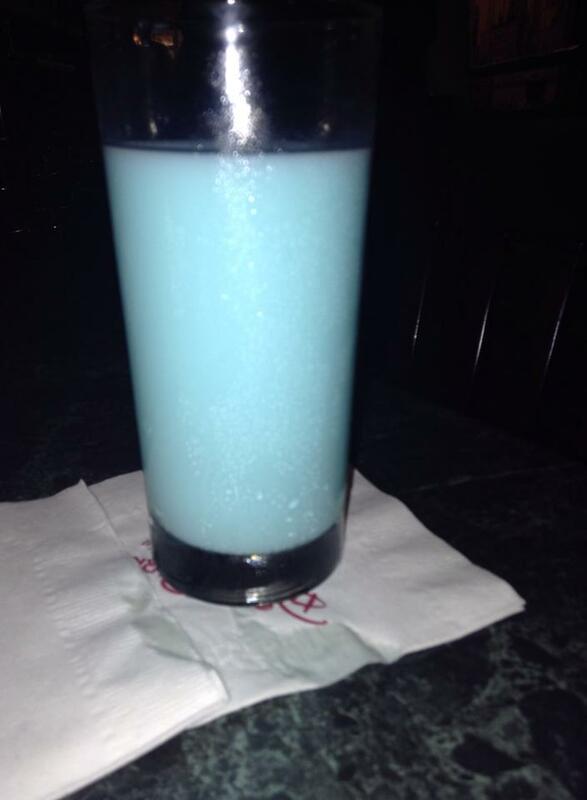 The chef came out immediately and discussed my dinner while the waitress brought out the blue milk. First sip was milk, the more of a Nestles Quik type of drink, then raspberry. It was not a pleasant drink. Being soy and gluten free he offered me the salad, French fries, pork wings, sliders, and the skewers. My friend can eat almost anything thankfully. I shared with him the Pilot’s Pommes Frites which are almost shoestring fries, minced then roasted garlic, parsley, and tiny shards of parmesan cheese. There is enough for two or three people. You can smell the garlic as you dig into the best French Fries I have had in a long time. 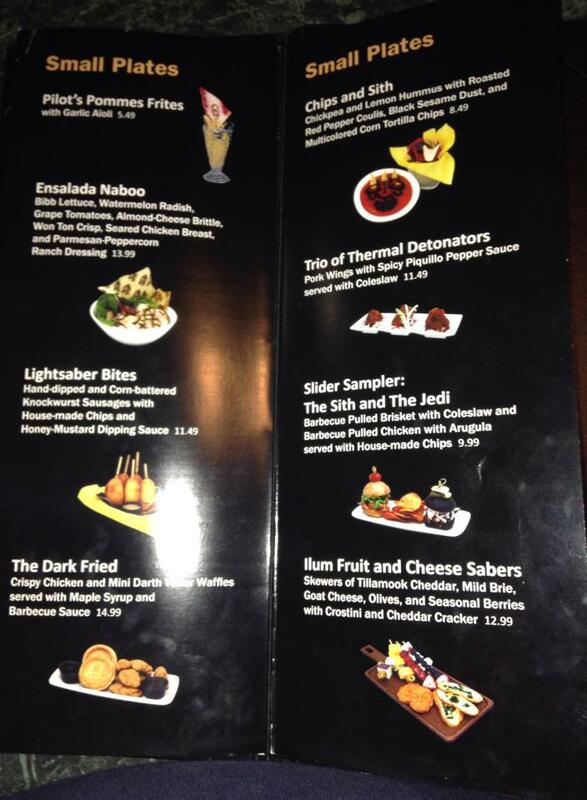 My friend loved the Lightsaber Bites which are corn dogs that use knockwurst instead of hot dogs. I tasted the honey-mustard sauce and agreed with my friend that a corn dog needs yellow mustard or Gulden’s mustard. 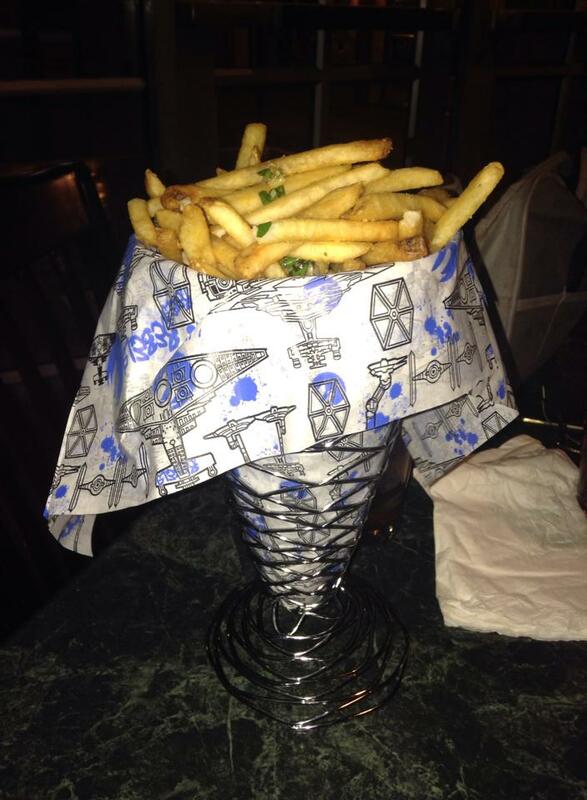 This came with the house made chips. I had the sliders on gluten free buns. It is called The Sith and The Jedi with “The Sith” being a delicious barbecue-braised brisket with cole slaw and “The Jedi” being barbecued pulled chicken with arugula. Mine came with house chips which we both agree are awesome and full of flavor. I was full from the fries but like a kid he gleefully dived into the Mini Darth Vader (chocolate-peanut butter), Mini Yoda (chocolate-hazelnut), and Mini Jabba the Hutt (salted caramel latte) served in a Han Solo Carbonite Souvenir Box. 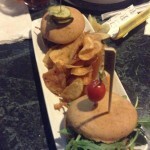 Overall the chefs are very good at using spices and herbs to season the chips and sliders well. 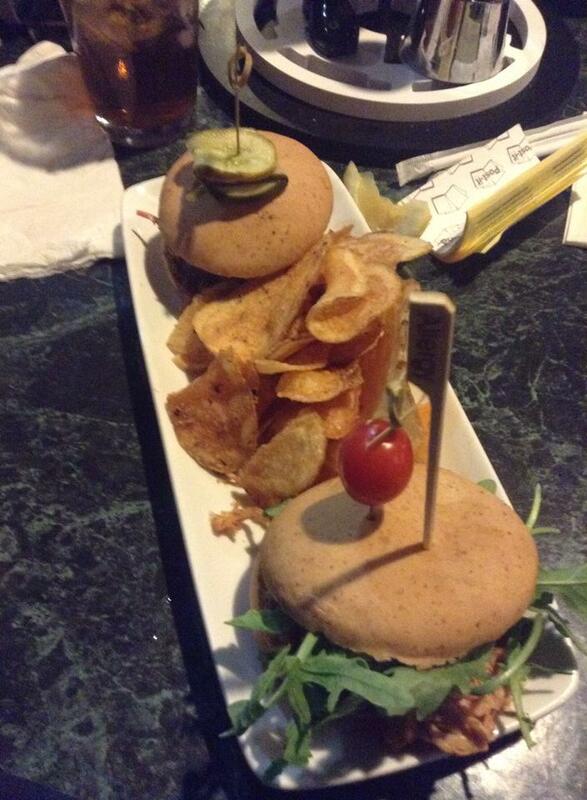 Everything we tried was flavorful and I think the sliders were as good at the ones at the Brown Derby Lounge. The only issue for me was the draft where we sat. Some guests may find the place to noisy and there are so many people going in and out that it can get on one’s nerves. Overall the seating and lighting are good and disabled guests should not have trouble getting around. Remember to use the main entrance as there are stairs in certain areas. It was well worth the experience and the prices are reasonable. $5.49 for a large order of fries that would fill me up. 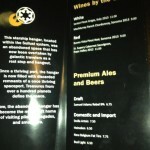 They offer beer, wine, specialty drinks, and the usual nonalcoholic beverages. The fries can be made vegan if they hold the cheese. The salad can be made vegan as well as one other dish. Vegetarians can find many dishes here that are vegetarian or can be altered to be vegetarian. The chef tried hard to meet my diet and seemed very knowing about the food he offered. I HAVE FRIES! If I won the lottery I would be there every night for the fries. They have family friendly dining as well as a nice place for adults to hang out with a few drinks with friends. Tonight it was 4 thumbs up!